I should probably take a moment to describe the interesting assortment of people I work with. 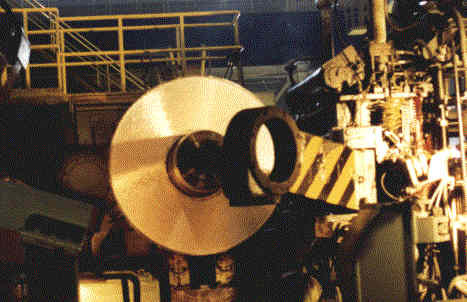 My client company was an aluminum rolling mill. It turns out that the Arabian peninsula is a good place to process aluminum, because it is very energy-intensive, and this is where the energy is. My clients are an American project manager from EDS and a Bahraini Information Systems Manager. The American is everything you would expect an EDS guy to be, but better. He’s a tall, athletic-looking, blonde, cheerful American – very amiable and easy to take. He’s in his fifties and much more dignified than I. He’s from Dallas, and his wife is an adorable Texas sweetie with big hair. He seems to be a good manager, but I couldn’t prove that yet. He’s spent his whole career with EDS and knows Ross Perot personally. The Bahraini is a character. He laughs a lot, and is very western in his attitudes. He is Shiite Moslem, though, in a country run by the Sunni Moslems, and has explained to me in some detail what that means about his future career (there isn’t much to it). Which is a shame, because he seems very good at what he does. Two young programmers are working with me: One is from the Philippines. He’s the typical quiet systems programmer who mostly only talks to computers. The other is more outgoing. He was born and raised in Bahrain, but his father is from Pakistan and his mother is from Afghanistan, so he is not considered a native. He doesn’t even speak Arabic very well. He is very jovial, smokes a lot, and is currently looking to buy a new car. He is very quick and is great to have as an assistant. I couldn’t make the progress I have been making without him. Sri Lanka just won the World Cup in cricket. Now you probably didn’t hear about that in your local paper, but I knew because we have three Sri Lankans in the office, who bought us all lunch that day. These fellows are quiet, but very smart. I know this because one of them bought my book, read it, and liked it. The Director of Finance and Administration is a woman who was born here, of Australian parents (her father was CEO of BAPCO, the Bahrainian oil company), was educated in the U.S., and carries a U.S. passport. She has lived all of her adult life here, though, and loves it. She speaks English with sort of an Australian accent, although it isn’t really like any I’ve ever heard. The General Manager of the plant is a hefty Scotsman who is apparently a pretty good manager, in spite of being treated like a servant by his boss, the Shaikh on his recent trip to the states. This was an interesting (!) experience for him. They visited New York together, then the Shaikh went to Chicago while John went to Indianapolis. Then they converged again in Denver for a trip to see Kodak in Fort Collins. The Shaikh is a member of the Royal Family, and he expects to be treated as such wherever he goes. When they would go out to dinner, he ordered the same thing for everybody. When they stopped at the factory outlet center on the way to the Denver Airport, he expected them all to look at the same stores. When they were a little late getting to the airport and he returned the rental car, he expected the plane to wait for him. The manager of production planning is from Manchester, England, and since that’s pretty far north, I originally took his accent for Scottish. He is the quintessential old timer, who has been around for a long time and really knows al-u-min-i-um (or aluminum, to us yankees). He is very cooperative with all us young consultants wandering around, but isn’t really too sure that any of us can do anything that will change the way he does his job. The only really annoying thing about him is that he may be an old-timer, but he’s my age! Still, he’s generous to a fault, as witnessed by the picture frame episode. I was eyeing his world map the other day (which shows both Grand Junction, Colorado, and Edison, New Jersey, where we once lived!) and he said he would see what he could do to get me one from the shipping line that produced it. He gave me the plant tour, and he let me go back a second time, with my camera, to give me a chance to take a picture of the cauldron in the re-melt furnace, with the nitrogen bubbling through it. He even gave me my very own aluminum circles with my name engraved on them. Then there are the three consultants from the UK who were here for my first week. These are very enthusiastic, well-spoken, bright young folks who are out to straighten out the world and make it work better. This will probably not happen in Bahrain, but with luck their contributions will be felt. The three are actually an interesting set: The boss is balding and bearded. He has a winning smile and is easy to talk to about just about everything. Another consultant, on the other hand, is tall, clean cut, and much more earnest. He has a commanding voice, but seems to take everything way too seriously. And the soft-spoken young lady seems very intelligent and extremely hard-working – I get the sense that she did most of the work in the project – but she didn’t have much to say. I discovered later, though, that she has been under the weather, and that may have something to do with it. Altogether, these are interesting people from literally around the world. Who’duh thought I would one day be working with such a group?